LOS ANGELES, California (CNN) -- California Gov. Arnold Schwarzenegger declared a state of emergency Sunday in San Bernardino County as a fast-moving wildfire burned through a national forest, threatening homes and forcing hundreds of evacuations. 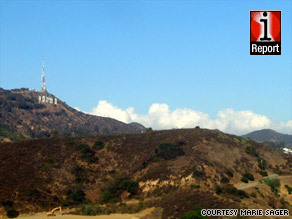 Marie Sager of Los Angeles, California, captured this photo of smoke visible Saturday from the Hollywood sign. "The Sheep Fire has now scorched 3,500 acres and is only 10 percent contained," said Carol Underhill, a public information officer with the U.S. Forest Service. A mandatory evacuation order is in effect for the entire community of Wrightwood and parts of Lytle Creek in San Bernadino County, the U.S. Forest Service said Sunday afternoon. Some 4,000 people live in Wrightwood. Underhill estimated as many as 1,000 people were trying to get out of the area. High winds, with gusts up to 45 miles an hour, were making conditions even tougher for more than 1,000 firefighters battling the blaze. A high wind warning was in effect through Sunday night. The wildfire was reported Saturday afternoon. Officials have not yet determined how the fire began. The emergency declaration allows the state to employ all its agencies and whatever personnel and resources are needed to help battle the wildfire.